“How to Combine Data from Different Sources Using Excel” is now available for Kindle at Amazon.com. 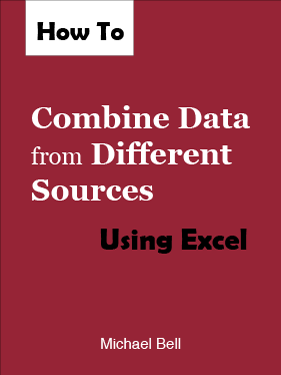 This eBook will teach you how to use Excel to to combine data from different sources. When doing analysis, you will no longer be limited to relying on information from just one spreadsheet. Instead, you’ll learn how to use Excel to pull in and integrate data from other sources. With this understanding, you’ll be able to look at more factors and answer more questions. This eBook focuses on the business process rather than just the software commands. Many of tutorials currently available for Excel are fairly technical in the way they approach the material, making it hard to understand how or especially why you might use a particular command. Instead of digging right into the technical details, “How to Combine Data from Different Sources Using Excel” presents one straightforward example from start to finish. Of course, it fully covers all the parameters of the commands referenced along the way, but this approach puts the technical information in context, making it is easier to understand. There are also a number of sections devoted to trouble-shooting, which will enable most readers to get up and running quickly. If data analysis is your kind of thing, check it out and please leave a review on Amazon as well.